Lo strumento C1209 è capace di analizzare gli intervalli di frequenza da 100 kHz a 9 GHz, offre intervalli dinamici di 145 dB, ed è progettato per funzionare con qualsiasi computer fisso o portatile Windows. Gestisce in modo efficiente applicazioni di test, e con dimensioni di 377 x 210 x 95 mm e un peso di soli 4.8 kg, il piccolo C1209 è di circa "mezzo rack" in larghezza e questo lo rende ottimo per ingegneri che cercano nello strumento produzione rapida senza che richieda troppo spazio. Lo strumento top della linea C1220 vanta un range di frequenza di 100 kHz fino a 20 GHz, offre un range dinamico di 145 dB, ed è progettato per funzionare con qualsiasi computer fisso o portatile Windows. Egli gestisce in modo efficiente applicazioni di test avanzati, provvedendo un impareggiabile rapporto qualità prezzo per uno strumento di questa categoria. Per raggiungere alte prestazioni a prezzi accessibili, il design e la produzione incorporano diversi nuovi approcci di produzione e di collaudo innovativi. 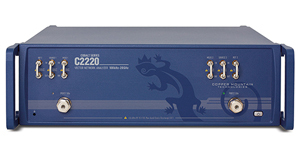 The C2209 2-port analyzer operates in frequency range of 100 kHz to 9 GHz, offers a typical dynamic range of 162 dB (1 Hz IF BW), and sweep speeds as low as 10 microseconds per point. Designed for operation with any Windows PC or laptop, C2209 offers Direct Receiver Access for special applications involving external directional coupling, including Load Pull and high-power measurements. 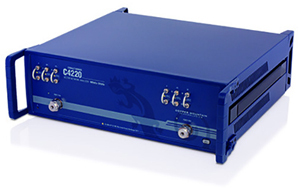 C2209 efficiently handles advanced test applications, providing an unmatched price-performance combination for S-parameter measurement for this frequency range. 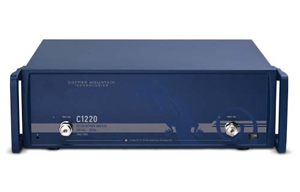 Copper Mountain Technologies' top-of-the-line C2220 analyzer boasts a frequency range of 100 kHz to 20 GHz, offers a typical dynamic range of 145 dB, and is designed for operation with any Windows PC or laptop. It efficiently handles advanced test applications, providing an unmatched price-performance combination for S-parameter measurement for this frequency range. Compared with the Cobalt C1220, C2220 provides direct receiver access for special applications involving external directional coupling, including Load Pull and high power measurements. 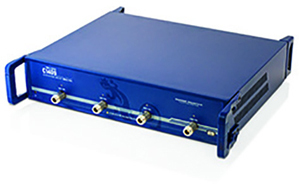 The C4209 2-port VNA operates in frequency range of 1 kHz to 9 GHz, offers a typical dynamic range of 162 dB (1Hz IF BW) and sweep speeds as low as 10 microseconds per point. Designed for operation with any Windows PC or laptop, this VNA is frequency extender compatible and forms the basis of the CobaltFx system. 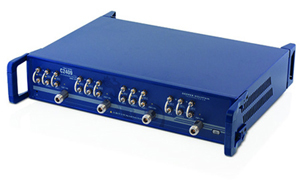 The C4220 2-port analyzer operates in frequency range of 100 kHz to 20 GHz, offers a typical dynamic range of 145 dB (1Hz IF BW), and sweep speeds as low as 12 microseconds per point. Designed for operation with any Windows PC or laptop, C4220 is frequency extender compatible and forms the basis of the CobaltFx system. 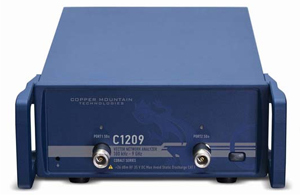 The C1409 4-port analyzer operates in frequency range from 100 kHz to 9 GHz, offers a typical dynamic range of 162 dB (1Hz IF BW), and sweep speeds as low as 10 microseconds per point. Designed for operation with any Windows PC or laptop, C1409 efficiently handles advanced test applications, providing an unmatched price-performance combination for S-parameter measurement for this frequency range. 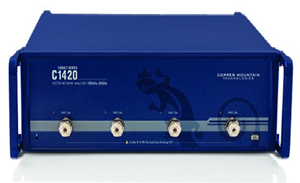 The C1420 4-port analyzer operates in frequency range of 100 kHz to 20 GHz, offers a typical dynamic range of 145 dB (1Hz IF BW), and sweep speeds as low as 12 microseconds per point. Designed for operation with any Windows PC or laptop. 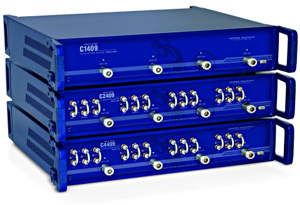 C1420 efficiently handles advanced test applications, providing an unmatched price-performance combination for S-parameter measurement for this frequency range. 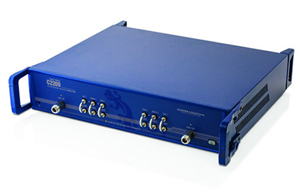 The C2409 4-port analyzer operates in frequency range of 100 kHz to 9 GHz, offers a typical dynamic range of 162 dB (1Hz IF BW), and sweep speeds as low as 10 microseconds per point. Designed for operation with any Windows PC or laptop, C2409 offers Direct Receiver Access for special applications involving external directional coupling, including Load Pull and high-power measurements. C2409 efficiently handles advanced test applications, providing an unmatched price-performance combination for S-parameter measurement for this frequency range. 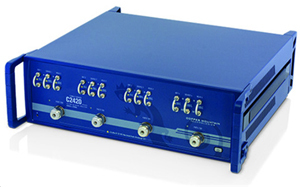 The C2420 4-port analyzer operates in frequency range of 100 kHz to 20 GHz, offers a typical dynamic range of 145 dB (1Hz IF BW), and sweep speeds as low as 12 microseconds per point. Designed for operation with any Windows PC or laptop, C2420 offers Direct Receiver Access or special applications involving external directional coupling, including Load Pull and high-power measurements. It efficiently handles advanced test applications, providing an unmatched price-performance combination for S-parameter measurement for this frequency range. 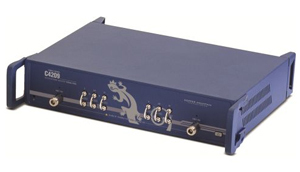 The C4409 4-port VNA operates in frequency range of 100 kHz to 9 GHz, offers a typical dynamic range of 162 dB (1Hz IF BW) and sweep speeds as low as 10 microseconds per point. Designed for operation with any Windows PC or laptop, this VNA is frequency extender compatible and forms the basis of the CobaltFx system. 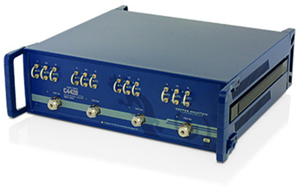 The C4420 4-port analyzer operates in frequency range of 100 kHz to 20 GHz, offers a typical dynamic range of 145 dB (1Hz IF BW), and sweep speeds as low as 12 microseconds per point. Designed for operation with any Windows PC or laptop, this VNA is frequency extender compatible and forms the basis of the CobaltFx system.